Anyone who has listened to death metal can easily bring the band Hate Eternal into their minds. 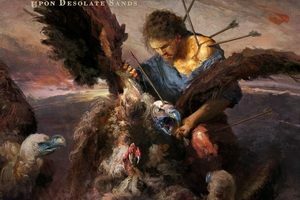 As one of the bands who consistently put out some of the most intense and brutality-forward material (though with a striking, underlying melodic contrast), they’ve worked their way to the top of the death metal elite. Last year saw the release of arguably one of the band’s strongest albums, Infernus. 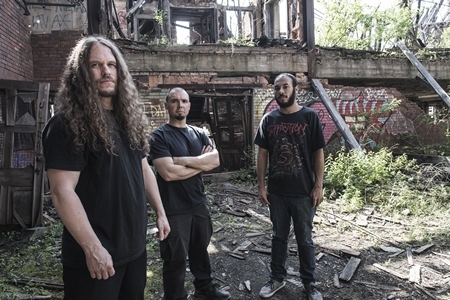 In the midst of their [now concluded] US tour with Vital Remains, Black Fast, and Inanimate Existence, DR was able to chat with frontman/guitarist/producer Erik Rutan. 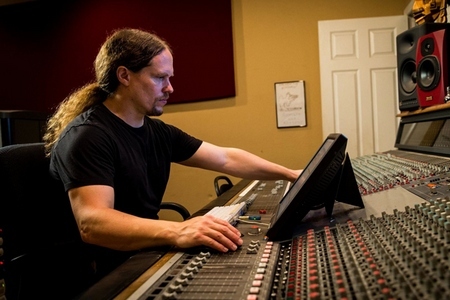 Rutan has made a name for himself, not only as a top-notch guitarist, but also as a producer, with his own Mana Studios now being just as renowned as the man’s work in Hate Eternal (or past work in Morbid Angel and Ripping Corpse). With Rutan’s veteran status, the recent loss of their most recent drummer Chason Westmoreland, and their current live drummer in Hannes Grossmann (ex-Obscura, Alkaloid), there was plenty to be discussed. Dead Rhetoric: Is this the first tour since your hand injury? Dead Rhetoric: Have you had any issues since the injury in playing live? Rutan: For the first few months I had to go through physical therapy and stuff like that to loosen it up. It’s still probably 90%, not quite 100%, but it hasn’t affected my playing. It’s doing better; it still gets stiff because I jammed the hell out of it, but it feels fine. It’s basically normal. It just took me a couple months to get it back. It’s doing much better – thanks for asking! Dead Rhetoric: Was the injury a moment when you said, maybe it’s time to slow down – or now that you have moved past it, was it more of a reason to keep going and persevere? Rutan: The night before the accident I slept like two hours – I drove 500 miles. So one thing that came out of that was that I need to sleep more on the road, and not that I’m careless, because I’m never careless, but maybe if I had slept more I wouldn’t have been in that situation to get into the accident. The other thing is that I need to slow down. We were the main support for Deicide so I was trying to get off stage real fast, and just slipped and jammed my finger into my rack. I was slipping down the stairs and I went into my sound guy. He caught the rack and my finger jammed in it. So I realized – slow down a little bit [on stage]. It might take 2 extra minutes but it’s not big deal. I’m always trying to be as professional as possible – be on time, get off on time. It’s definitely not going to slow me down [in terms of the band]. The only thing that will slow me down is myself, and that’s not really in my DNA to slow down. Dead Rhetoric: Infernus came out last year so you’ve had some time to sit on it at this point. How do you feel about it overall? Is there anything you’d go back and try to do differently? Rutan: Every record I do, if you give it enough time – there’s something I would change or re-do. I’m pretty perfectionistic about everything I do, so I’ll always find flaws in it. As a whole with Infernus, there’s so many things I’m happy about. That includes all of the songs. Sometimes years go by on a record and I say, “yeah, that song sounds okay” but with Infernus, I feel like every song was meant to be there as it is. The production also came out just as I had hoped. 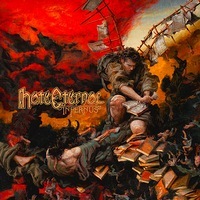 It’s obvious to me that it’s the best production that I have done with a Hate Eternal record. I really couldn’t be more pleased with the album. Dead Rhetoric: Obviously you are on tour right now, and you have Hannes [Grossmann] with you on the drums. How has it been going with him so far? Rutan: He’s doing a great job. This is our second tour together. I’ve known Hannes for about 5 years from touring with Obscura and Hate Eternal. As you know, I’m sure, he’s an awesome drummer and a great guy. He’s put a lot of hard work into it and it’s going really well. 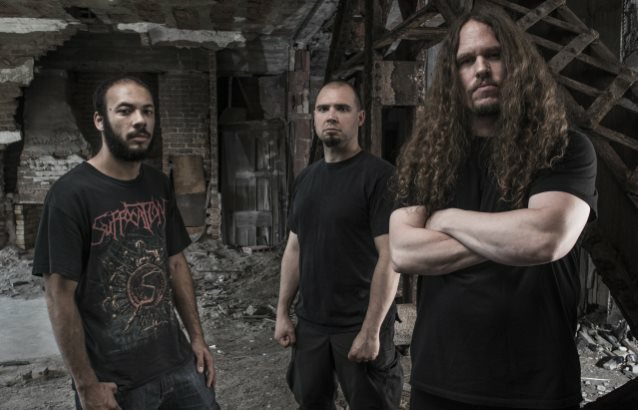 Dead Rhetoric: How did you manage to get him involved with Hate Eternal? Rutan: About 6-8 months ago, Chason [Westmoreland] said he couldn’t tour – he had some family things going on. So we talked with Gordon, our manager on Season of Mist, about potential options. I remember touring with Obscura, and Hannes is an amazing drummer and is super professional. He also plays with Alex [Webster] of Cannibal Corpse in Blotted Science – I just figured he’d be a great guy for the job and he would take it very seriously. At this level of where I am at and what I’ve done with my career, I really want to jam with the best of the best – I always have. I don’t settle for less, I never have. Hannes is one of the best drummers out there, and I’m pleased to have him playing with me. Rutan: I don’t know, if you compare us to like, The Faceless or someone, we’ve been a band twice as long and have about the third of the members…so not too bad. Most bands these days, they go through a lot of people and that’s the way it is. People come, people go. Find me a band with the original line-up – it doesn’t exist. I don’t mean that to be derogatory – every band I know has had a lot of line-up changes. The music business is hard. Some people are in it for the long haul and some people are not. Some people have expectations that aren’t realistic and some people don’t. For me, I’ve had people come and go, I’ve had a bandmate pass away, I’ve had a lot of things happen in Hate Eternal in 20 years. I just keep looking forward because at the end of the day, I’m always going to have Hate Eternal as long as I choose to have it. Fortunately for me, I write the majority of the music and lyrics. I’m the singer and the guitar player so I cover a lot of jobs in Hate Eternal. I look at it in the sense that I have been able to play with some freaking fantastic drummers. I view it almost like a jazz trio now. I’ve jammed with Tim Yeung, Derek Roddy, Jade Simonetto – I had Adam Jarvis to one show, Reno Killerich did a European tour, Kevin Talley did an American tour, Chason did Infernus and the Metal Alliance tour, and now Hannes. Of course it’s complicated to jam with different guys, but at the same time it’s been quite pleasurable to be able to play with them. You throw on Pete Sandoval, Brandon Thomas, Howard Davis, and the other drummers I’ve played with in my career – I’ve played with the best. I will certainly never complain about that. I guess if I had played with so many drummers where some weren’t so great I might feel differently, but for me I feel very blessed to have such an amazing cast of drummers come out of Hate Eternal. Rutan: You have to. In this day and age, it’s a different world from when I started with Ripping Corpse. When we were in Ripping Corpse, we were all friends and knew each other from when we were teenagers. It was a much different environment. Nowadays, every band has had a line-up change because people come and go. It’s a hard life, being a touring musician. Finding a job that supports you to tour, because it’s almost impossible to make a living as a touring musician. It’s a challenge! Let alone if family things come in. I always try to look at the bright side of anything. The first half of my life I dwelled on so much negativity, and the second half I have turned that negativity into something way beyond what I ever anticipated. That’s just by turning the negative into a positive. I’m always trying to look in a positive fashion. Dead Rhetoric: So do you have any plans on finding a drummer, or is it just up in the air until you are ready to record a new album again? Rutan: Pretty much. Hannes has done these two tours, and we’ve talked about doing some future tours together and we’ll see how it goes. We are still touring for Infernus so I’m in no hurry to make any future or permanent decisions. I’m just taking it as it comes. But I can guarantee that whoever does the next record will be a badass!